It is increasingly common for users to have more than one email account on different servers, as a way to use the accounts for different purposes (eg, one more for work and another for personal purposes). The two free mail servers have been able to reap greater success over the years are Hotmail and Gmail, the stakes of Microsoft and Google respectively. 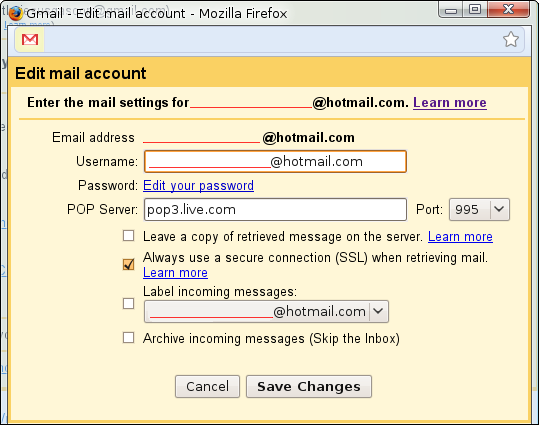 Today we tell you how to receive your Hotmail messages in Gmail and Hotmail sending messages from the Google platform. One of the interesting options offered by Gmail is its ability to integrate with other email accounts. To add an account consistent with this possibility, we have to go to Gmail settings (first press on the icon of a nut and then setting). We choose Accounts and Import tab and then "Add a POP3 account you own." In the next step enter the email account you have with Hotmail and then we will get a window where you have to check the options you want set and where to enter the password for that account. When synchronizing recommend using a different label for Hotmail mails because otherwise all emails from the Hotmail account will go directly to messages received and can be confusing, especially if we use each account for purposes different. Furthermore, the creation of the label is another reason syncing Gmail accounts will download all emails that we have in the Microsoft account and mark them as unread. Select the option "tag incoming messages" and create a new label with the name you want. We also recommend leaving a copy of retrieved message on the server, because otherwise it will delete the messages that Gmail retrieves in your other account. We can add the account. Gmail also will ask if you want to send messages from the Hotmail account from the Google platform. If so, we are asked to remember the name and data that we have inserted. We can handle messages with an alias (the identification that appears when we change the account from which you send). We give next step and then choose the easiest option, ie, send messages through Gmail. The account you send us a mail with a check verification code will be inserted into a box. From now on, we can manage our emails from Hotmail and Gmail account sent from Microsoft. To send messages from the Hotmail account, when composing a message will appear a drop down menu at the top of the message (which brings ...) where we can choose the account from which you send the message.